Planning to do a kitchen remodel this year? You can spend more money on the kitchen than any other room in the house but you can also re-coup 65-70% of your costs when the house is sold if you do it right. The secret to a successful kitchen remodel is knowing what mistakes to avoid. You want to make smart choices to maximize your return on investment. The National Kitchen and Bath Association recommends that you spend at least 6 months planning your kitchen remodel. This way, you won’t be inclined to switch gears during the renovation which would generate change orders, which would increase construction costs and hurt your budget. You’ll want to have drawings/plans made but if you are not working with an architect, you can do it yourself with 3-D design software like Google’s SketchUp or you can use the planning tool this online planner is a 3D online kitchen planner that can help you plan your kitchen. It is an easy to use software that runs problem-free and without any downloads on your computer. Study your existing kitchen and create a drawing with measurements for doorways, walkways, countertops, etc. Make a detailed list of everything you want to include in the remodeling of your kitchen. Include that folder that you have kept over the years of all the pictures you have cut out of magazines and newspapers…ideas, rooms, architectural details that have interested you. If you are going to be spending a lot of money on your kitchen remodel, consider hiring professional kitchen remodelers or designers to help you. They can simplify your kitchen remodel. They can help you make decisions and foresee any potential problems. If at all possible, do not change the location of appliances, plumbing pipes, and electrical outlets or go knocking down walls when you undertake your kitchen remodeling project. This will significantly increase the cost of your kitchen remodel and this is usually where unforeseen problems occur. Appliances are devices used to heat and cool and store food. Your kitchen remodeling project should be about the design and functionality of the kitchen not about the appliances. Task Lighting: Under-cabinet lighting is a must, since cabinets create such dark work areas and since you are remodeling, it’s the perfect time to do the basic wiring for your under cabinet lighting. Plan for at least 2 fixtures per task area to eliminate shadows. Look at pendant lights for islands and other counter areas without low cabinets. Also, recessed lights and track lights work nicely over the sink area and areas where you prep your food as long as there are no cabinets overhead. Ambient Lighting: For general lighting in the kitchen, use flush-mounted ceiling fixtures, wall sconces, and track lights. Include dimmer switches to control intensity and mood. Your top priorities during kitchen remodeling should be functionality and durability. Avoid the low-quality bargains and select products that combine low maintenance with long warranty periods. Solid-surface countertops, for instance, may cost a little more, but with the proper care, they’ll look great for a long time. Example 1 – You really need more storage space, but you plan to move in a few years and would rather not invest in custom cabinets. Affordable alternative: Consider working a walk-in pantry into your plan. It’s a remarkably economical way to upgrade your kitchen—a pantry can supply as much storage as a wall or more of custom built-ins. 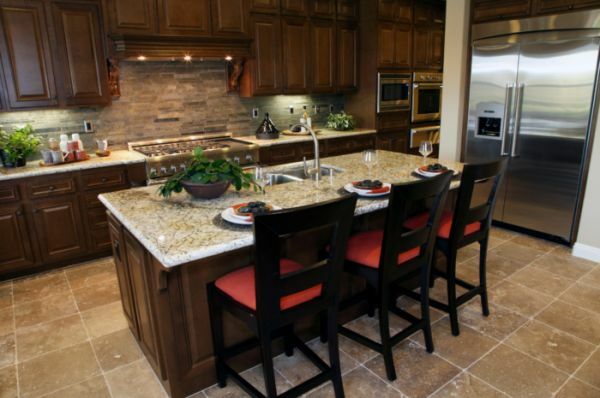 Example 2 – You want granite countertops, but they are pricey and don’t exactly fit into your kitchen remodeling budget. Affordable alternative: If you love the look of granite—or soapstone or marble or corian or handcrafted tile for that matter—work it into your kitchen remodel plan. But instead of using it for every countertop, try limiting it to a high-visibility island or to the areas flanking the range. Elsewhere, use a less expensive option like a laminate or ceramic tile. Combining the different mediums also adds visual interest. Example 3 – Simple cosmetic upgrades, such as a fresh paint job, new cabinet hardware, upgraded counters or flooring, and a couple of new appliances can transform your kitchen. Put in cabinets that go all the way to the ceiling. They will cost a little more but you’ll gain more storage space and you won’t have to dust the tops of the cabinets. Mount shelves on unused wall areas and inside cabinet doors. Suspend stock pots and skillets on a ceiling-mounted rack and add hooks to the backs of closet doors for aprons, brooms, and mops. The best place to start is to get recommendations from your friends if you do not have a remodeling contractor that you like. If your friends do not have any recommendations, find contractors that have professional looking websites with lots of references on their site. 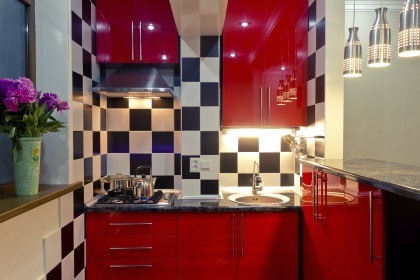 Look for a contractor that specializes in kitchen remodeling. Remember, the best contractors are often the busiest contractors. Build your schedule around the remodeling contractor of your dreams not vice-versa. Ask your top 3 candidates to supply references, and call some of their most recent ones. Above all, it’s your choice. It’s your house and it’s your kitchen remodel project. Take your time. You are spending a lot of your money on your kitchen remodel project and you should get what YOU want and don’t let anyone tell you differently.